During the Caledonian mountain building and later, along what is now the Hardangerfjord, the earth’s crust probably collapsed from top to bottom along the Hardangerfjord Shear Zone, a plane that slopes toward the northwest. On the northwest side of this zone the ground sank down several kilometers. 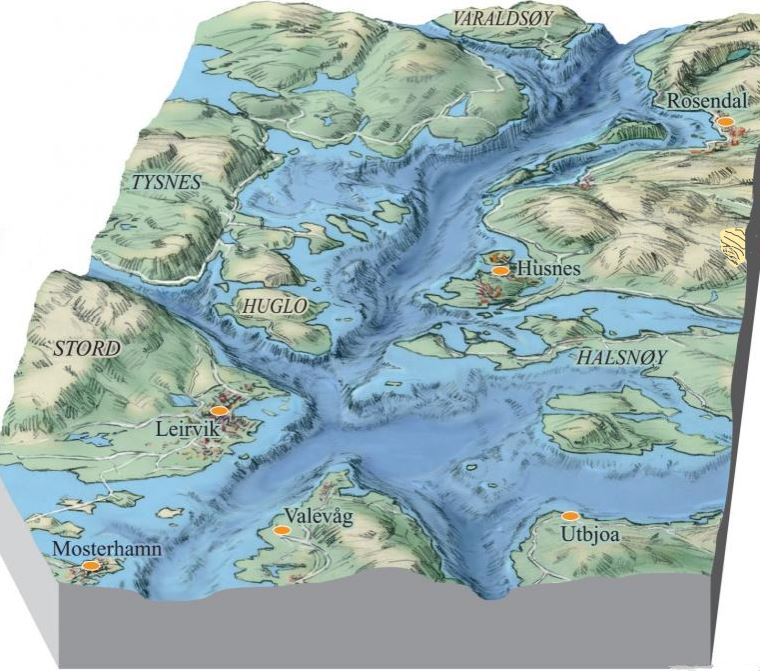 The geological map picture of Hordaland reflects this movement. On the Folgefonn Peninsula the Precambrian basement was carried all the way to the top, and is even found on tops that are over 1500 meters high. On the northwest side of the Hardangerfjord, however, the basement has most places been buried deep under the Cambro-Silurian phyllite and on top of this by the thrust sheet during the Caledonian mountain building event. If one follows the surface of the Precambrian basement, it lies deep down on most of the northwest side of the fjord. The basement surface can be said to be a gigantic staircase. Innermost in the Hardangerfjord much of the Cambro-Silurian layers disappear, and with this also the difference in height between the Folgefonn Peninsula and the NW side of the fjord. The contrast between the naked rock and the forested slopes at Lussand shows clearly where the Cambro-Silurian layers end and the Precambrian basement takes over. At this spot the Hardangerfjord Shear Zone comes up from the fjord. It is one of the most important geological structures in Western Norway. Other weak zones were established in north-south, northeast-southeast and NNE-SSW direction. The shape of the Hardangerfjord and its tributary fjords we see today have roots more than 400 million years back in time, when the weak zones in the bedrock were created, which later in large areas would be eroded by the ice during the ice ages to be formed to valleys and fjords. 3 – The contrast between phyllite and precambrian basement is clearly visible at Lussand. During the Ice Ages, Norway, or at least large parts of the country, was covered with ice, which had an eroding effect on the bedrock and contributed significantly to the shaping of today’s fjord landscape. 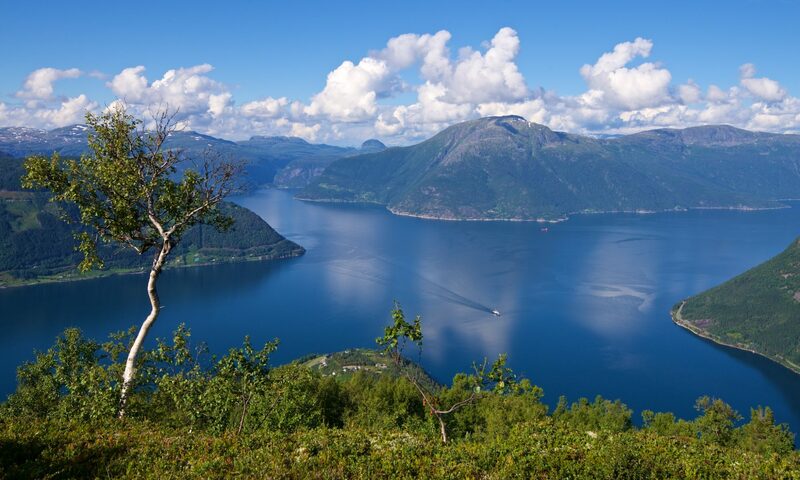 As for the Sognefjord, the Hardangerfjord is presumed to follow a pre-glacial, so-called paleic river system. 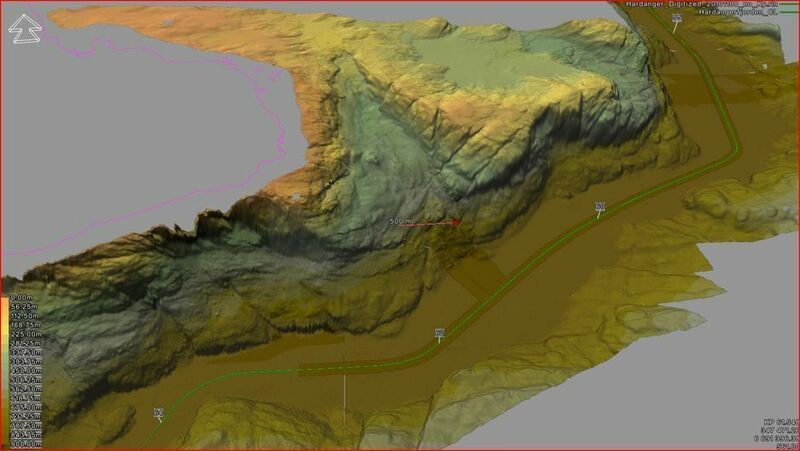 It is, however, difficult to reconstruct the paleic surface along the fjord area as it is today. Through erosion the ice created overdeepening in the Hardangerfjord. This also gave the fjord basin where the fjord is at its deepest today, which means the basin in the main fjord outside Øystese, where the depth of 860 meters is reached. If we take into account the layers of sediments (clay, silt, sand etc.) in the fjord in these areas, the ice seems to have been more than 1000 meters thick in this and other areas along the main fjord, but how thick is a matter in dispute. The ice got much thinner towards the cost and today’s North Sea area. In the same way as valleys some places have hanging valleys more or less perpendicular to and above the main valley, the main fjord got tributary fjords, “hanging” in relationship to the main fjord. In one case one tributary fjord, Ulvikfjorden, is hanging relative to Osafjorden, another tributary fjord, which in turn is hanging relative to the main fjord. Towards the end of the last Ice Age, the ice melted down and the front of the ice retreated. The melt down process had a number of breaks due to climatic changes in the outer parts of the fjord and in some of the tributary fjords. During melt down and retreat of the ice front, large amounts of mostly clay and silt but also some sand and coarser material were deposited on the bottom of the fjord. Most of the sediments in the Hardangerfjord were deposited this way. When the front of the glaciers had melted down and retreated so they were lying in today’s Eidfjord, Ulvik, Osa, Granvin, Kvanndal, Øystese, Mundheim, Rosendal and more places, the melt water carried sand, gravel, stones and boulders and built up large terraces along the fjord. The largest we find in Eidfjord and is more than 1 km long. 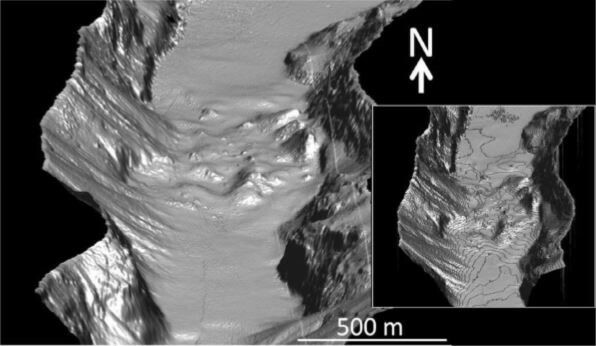 When these ice front deposits were built up, finer material from the meltwater flow was deposited in the fjord, building up a second layer of sediments on the bottom. After the land ice had melted away from the fjord areas, the land uplift started, with the consequence that ice age terraces and moraines that had been built up were eroded and large deltas under water were built up. 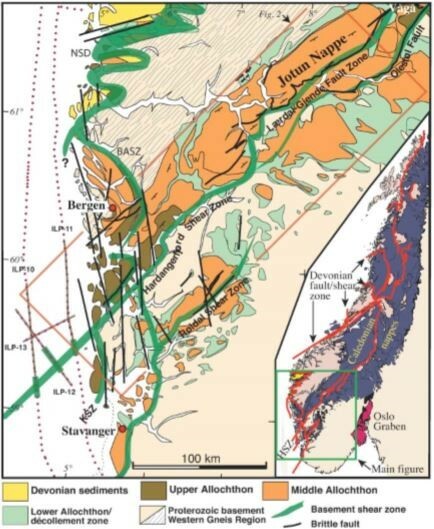 This and the results of sediment mass movement on the fjord bottom, both as bottom flows, slides from tributary fjords, as well as subaerial rock fall into the fjord, have contributed to the upper main part of the sediments in the fjord, both in the main fjord and the tributary fjords. The landscape we see today in the Hardangerfjord area has been shaped as the result of many different processes. The land ice also contributed significantly by depositing moraine, meltwater deposits, clay/silt deposits etc. Furthermore, weathering processes have contributed, in addition to downflow movements of sediments and other processes. 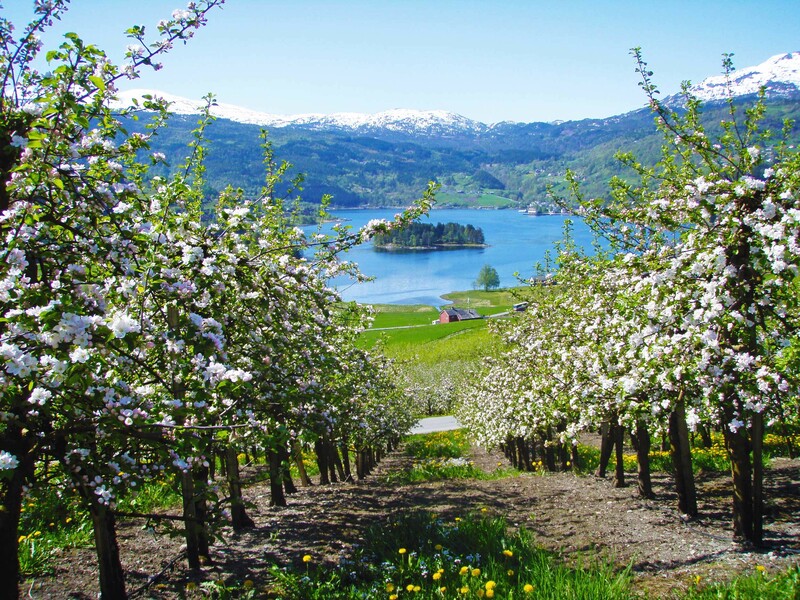 The soil conditions, together with the fjords ability to create a favourable climate, make Hardanger as Norway’s “fruit garden” possible. 4 – Fruit flowering in Ulvik, Hardanger. 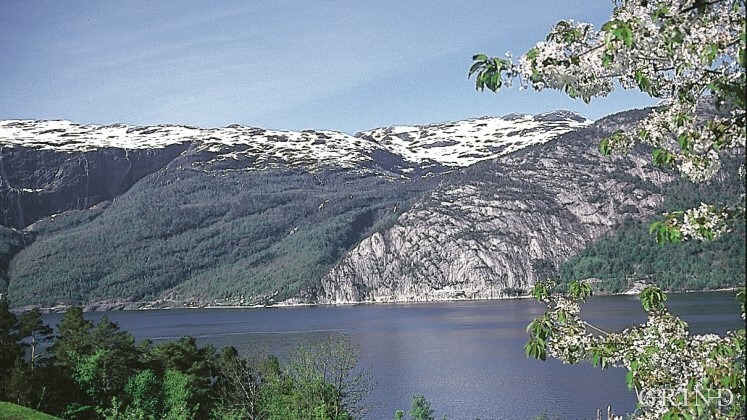 5 – Eidfjord in the innermost of the Hardangerfjord with the large last Ice Age terrace. Many of the processes which have contributed to the shaping of today’s Hardangerfjord landscape are still active. Different forms of downslope movement are important processes, especially in the inner parts of the main fjord, and in the tributary fjords. Rock fall, rock avalanches and debris flow occur from time to time, often due to heavy precipitation, and during the winter snow avalanches are quite common some places. These processes are challenging for the local communities and for the road traffic in general. The highest reaching mountain top in the Hardangerfjord area is Onen in Eidfjord, reaching 1621 m. On the Folgefonn Peninsula there are also the two tops Solnut, 1552 meters high, and Melderskin, with a maximum height of 1426 meters. 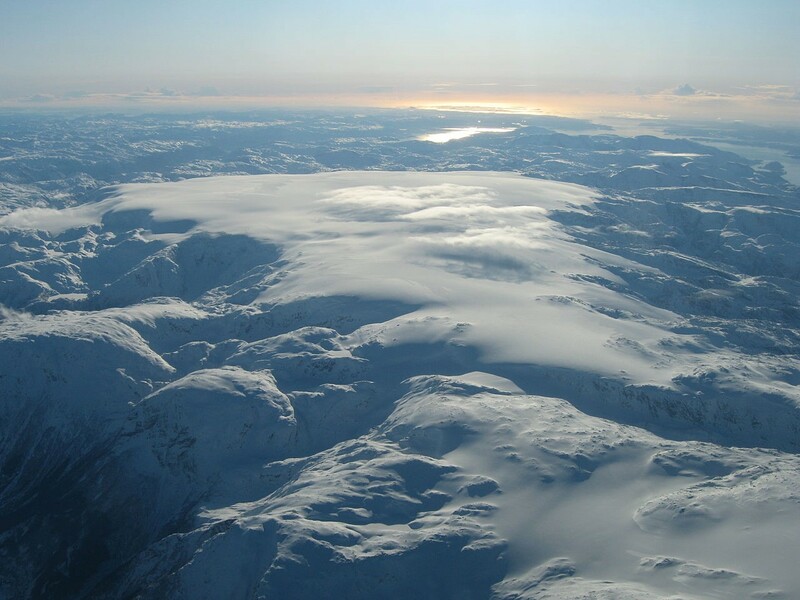 The Folgefonna Glacier on the peninsula which bears the name of the glacier, is not a remnant from the last ice age. It started to come back after the last ice age around 5000 years ago, and parts of it appeared even as late as 2300 and 1400 years ago. Folgefonna is the third largest glacier in Norway. The Hardangerfjord has seven tributary fjords. These comprise Maurangerfjorden, Fyksesundsfjorden, Granvinfjorden, Ulvikfjorden, Osafjorden, Simadalsfjorden and Sørfjorden. In addition there are some sounds in the outer areas, as e.g. Langenuen between the islands of Stord and Tysnes, and Høylandsundet between the Halsøy island and the Folgefonn peninsula. Several of the Ice Age terraces are today used as gravel pits, as sources for production of mineral material of different grain sizes. However, they should not be completely consumed, as they are memorials of the last Ice Age. Especially important is it to preserve the Eidfjord terrace for the future. Some of the Ice Age terraces and river deposits are sources of ground water and able to serve as sources for municipal water supply. 6 – The Folgefonna glacier on the Folgefonn peninsula. 7 – The waterfall Nykkesøyfossen (Kinso river). In the inner parts of the Hardangerfjord area there are several rivers coming down from mountain areas around that create numerous magnificent waterfalls. They are results of other landscape shaping processes and are themselves slowly shaping the landscape. In other words they are both tool and result when it comes to landscape shaping processes. The most famous of the waterfalls is Vøringfossen in Eidfjord, but also Låtefossen in Odda has gained a reputation. 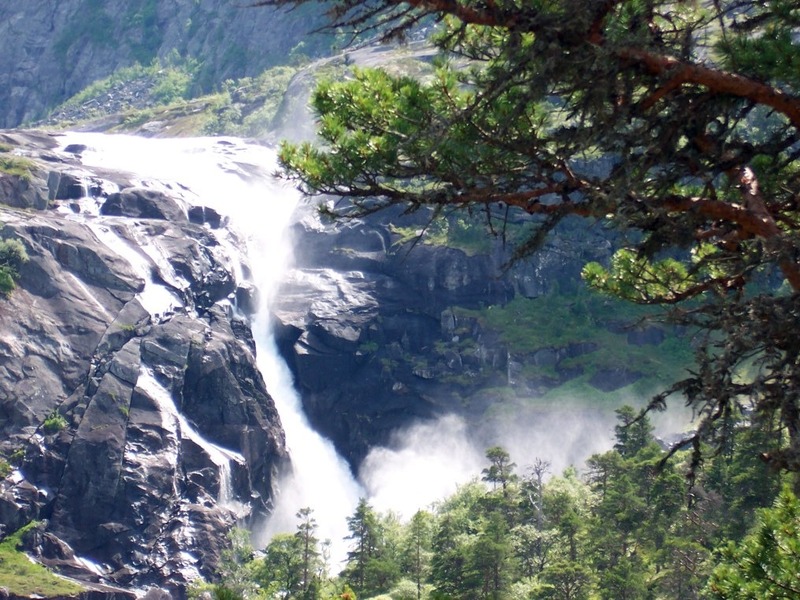 Between the fjord and the mountain plateau, the river Kinso creates four great waterfalls. This river as well as some other rivers with their waterfalls have been protected officially by the Norwegian Parliament. The Hardangerfjord is, in contrast to the Sognefjord, divided into four main basins, separated by thresholds. The outermost basin reaches from the outlet of the fjord into the North Sea and to the south of the island of Stord, where the road tunnel Bømlafjordtunnelen of the transport system arrangement Trekantsambandet goes through a rock threshold. The depth of this basin is up to 370 meters and the sediment thickness is up to around 80 meters. 8 – The bottom morphology of the outer parts of the Hardangerfjord (SW-NE view). The next basin lays between Stord and the island of Halsnøy. This basin is up to 400 meters deep and the sediment thickness is up to maybe 225 meters. In this basin the lower “extra” layer of sediments has been suggested to be remnants of a considerably older layer, maybe from a warmer period between two ice ages or from a warmer period within an ice age. Between the two islands Halsnøy and Huglo, the sediments in the Hardangerfjord reaches its maximum thickness; around 270 meters. The basin reaching from these two islands and to Jondal, has a maximum depth of around 700 meters, while the sediment thickness is up to 200 meters in this part of the Hardangerfjord. 9 – Multibeam echosounder view from Jondal to Varaldsøy (in the background) (view from NE to SW) showing the shape of the fjord bottom in the area. The fjord basin between Jondal and Eidfjord is the deepest of the basins. 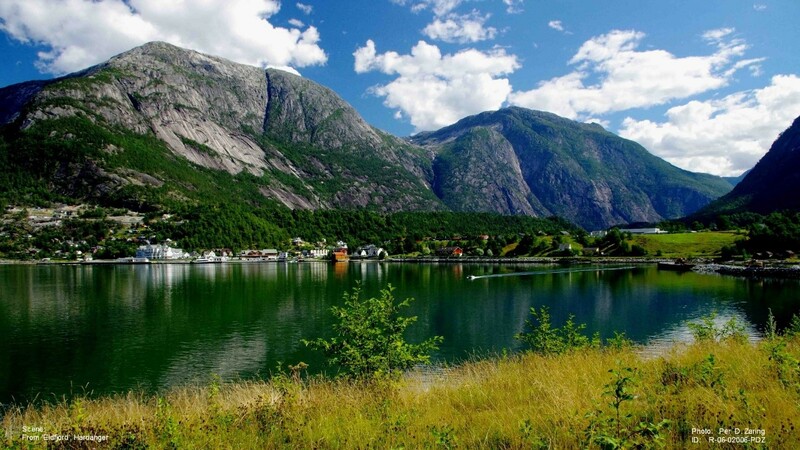 Here the fjord reaches its maximum depth of around 860 meters. The sediment thickness below bottom is up to 250 meters in this part of the fjord. Around the same can be measured outside the former ferry station at Bruravik between Utne and Eidfjord. 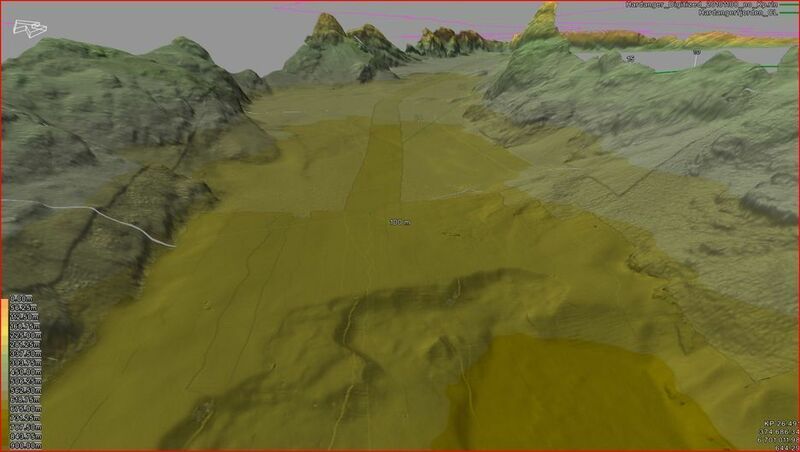 10 – Multibeam Echosounder view of the bottom of the main fjord near Nordheimsund and Øystese. 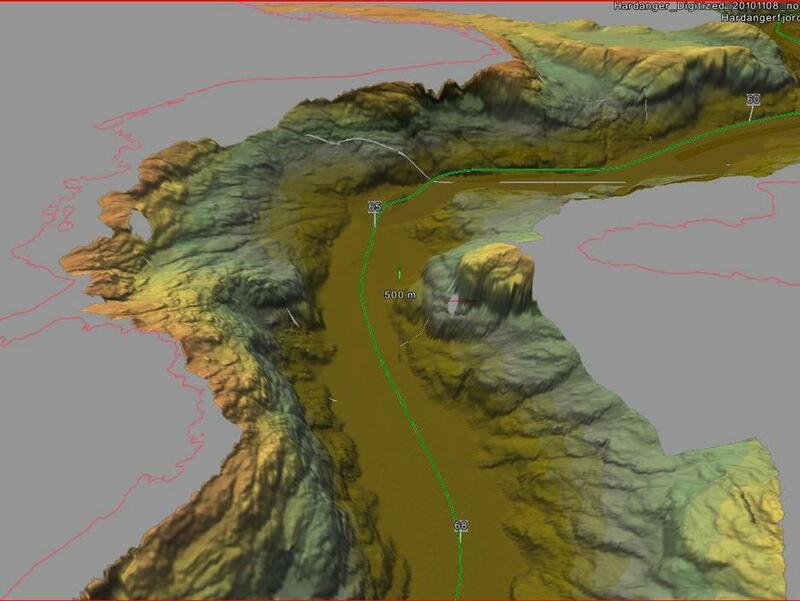 11 – Multibeam Echosounder view of the bottom of the main fjord from Ålvik to Utne and the Granvinfjorden tributary fjord. 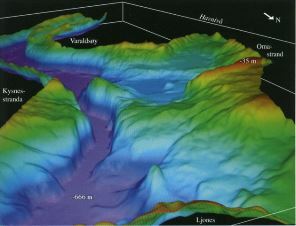 12 – 3-D modelling of the bottom in the Sørfjorden tributary fjord. A rock avalanche has spread over the bottom from the Folgefonn peninsula. 13 – Multibeam Echosounder view from the Simadalsfjorden tributary fjord. Results of submarine mass movement into the main fjord can be seen in the front. 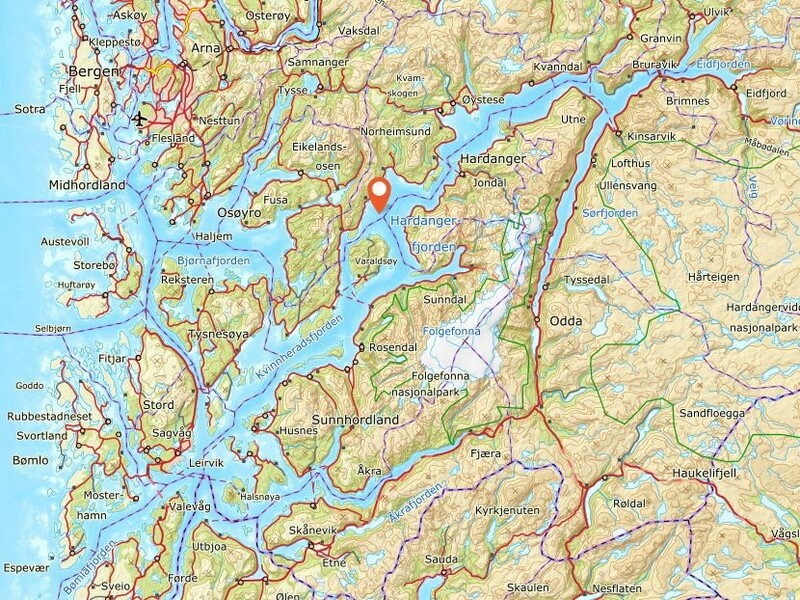 During the last more than 50 years a number of scientific surveys have been carried through in the Hardangerfjord and its tributary fjords, providing information about the fjord bottom and the sediments in fjord. During these surveys seismic data, echo sounder data and sediment cores have been obtained. 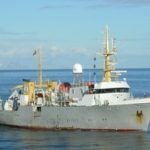 These scientific cruises have been performed by the University of Bergen, The Geological Survey of Norway and private companies. 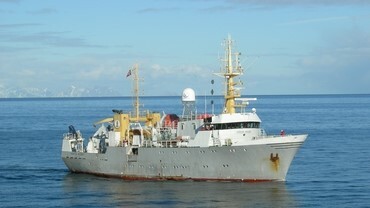 One of the ships used for such purposes was bearing the name “FF Håkon Mosby”. 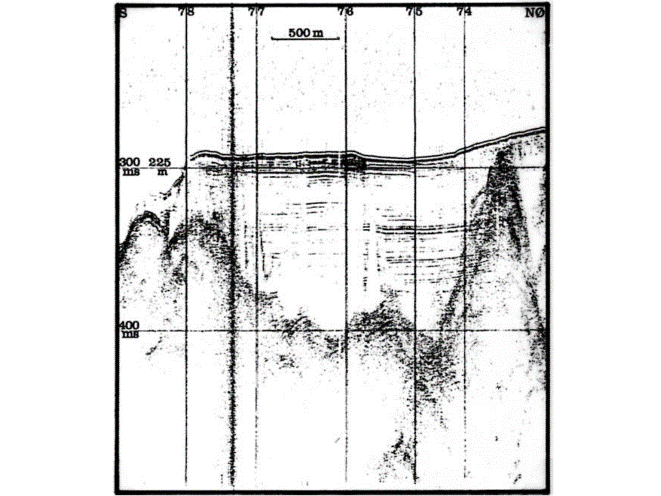 15 – Seismic profile from the outer Granvinfjorden tributary fjord. The profile goes S-NE. 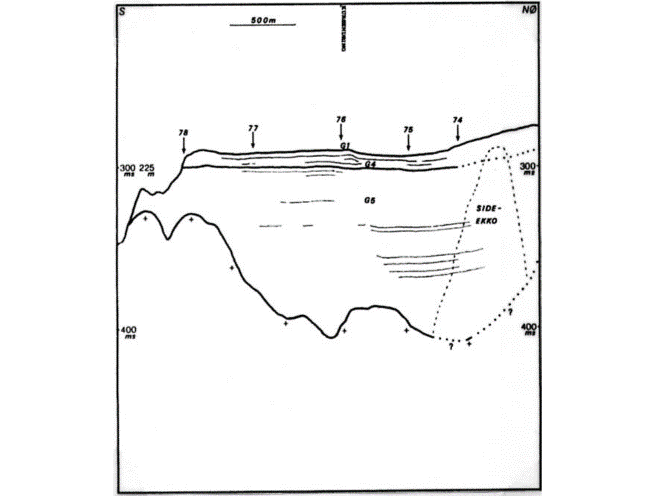 16 – Geologic interpretation of the seismic profile above from the outer Granvinfjorden. Brekke, N. G. et al. (red. ): Kulturhistorisk vegbok for Hordaland. Hordaland fylkeskommune. Nord 4. 1993. Bergen. Brekke, N. G. et al. (red): Folgefonna og fjordbygdene. Nord 4. Bergen Museum. 2008. Bergen. Helland-Hansen, W. et al. (red. ): Naturhistorisk vegbok for Hordaland. Bergen Museum-Nord 4. 2004. 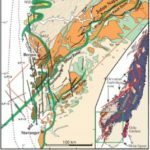 Hoel, C.: Seismisk stratigrafi av sedimentene i Hardangerfjorden og sidefjorder. Hovedfagsoppgave i geologi. Bind I & II. Universitetet i Bergen. 1992. 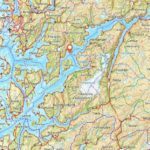 Hoel, C.: Kraftkabel i Hardangerfjorden – et geologisk perspektiv. Hardanger Folkeblad nr. 21. 2006. Enjoy the great view to Simafjorden and Eidfjord from Kjeåsen Mountain Farm in Eidfjord. The Måbødalen Valley and Vøringsfossen Waterfall are two tourist attractions visible from the road. You can drive to the view point and see the Vøringsfossen Waterfall from above, or you can do a short 45 minutes hike and experience the waterfall from the below.